Niantic Seal is a custom fabricator of high performance materials providing a broad range of sealing solutions for aerospace / aircraft applications. 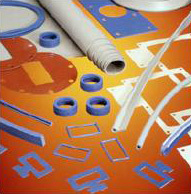 Our products include O-rings, fabricated gaskets and custom hose assemblies. At Niantic, we work with you to understand your problem and to provide the highest performing and most cost-effective solution. We employ our fully equipped lab facility, where our engineers design and fabricate high-quality products to exactly fit your application need. We then stay with your project through every stage, making certain our engineered solutions not only meet but exceed your highest expectations.